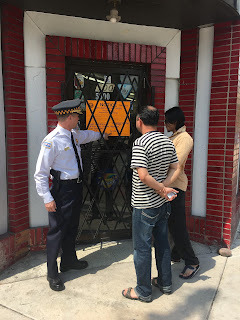 Quik Stop, located at Argyle and Sheridan, is having a going-out-of-business sale and will close by the weekend. It was shuttered by the city last April, and reopened after a couple months. This closure appears to be voluntary, and permanent. "This morning there was a hand printed sign on the door announcing "50% off almost everything" so I stopped in to ask what was up. The older man at the counter replied that the store would be gone by Saturday or Sunday. As I said in an email to Ald. Osterman, and I say now, I hope that space can be put to some good use, not as a "convenience" store and not having anything to do with alcohol (hey, Foremost is only a few doors down) or cigarettes. Maybe even its garish red and white exterior can be stripped off. I live nearby and know first-hand what a problem that store has been--especially in warmer months. This has been nothing but a source of trouble, especially in the summer when it seems to be a magnet for the regiment or division sized bad element in the neighborhood. There are other convenience-type stores nearby, both on Sheridan and on Argyle." I'm wondering what will replace it? Hopefully.. another restaurant.